On its opening the New Acropolis Museum immediately became a landmark on the Athenian landscape, and has attracted a phenomenal number of visitors. The Friends of the AAIA are very pleased to offer a guided tour of the museum. In order that most can be made of the tour our guide, Stavros Paspalas, will present a 40 minute lecture in the Institute Hostel prior to the tour itself. The museum houses, of course, the Parthenon marbles which remained in Greece, as well as a wealth of material from other temples, earlier and later in date, from the Acropolis and its immediate environs. The combination of lecture and tour will set all these antiquities, most of which are unique in quality, in their proper context. The Lecture will start at 11 am at the AAIA Hostel (4th floor, Promachou 2, cnr. with Parthenonos, Makriyianni – just a 5 minute walk from the museum). The Tour will start at the entrance of the New Acroplis Museum at 12:20. 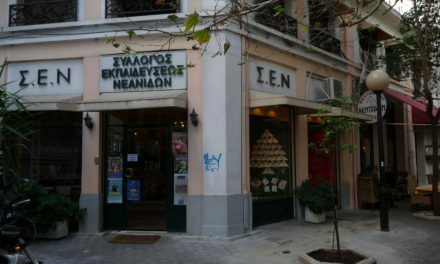 After the tour we have arranged a pre- Christmas lunch at the taverna “Diogenes” (Plateia Lysikratous, right behind the Lysikrates monument), a short walk form the museum. We shall meet at the taverna between 2:15 and 2:30. We do hope that you can join us, and partake in some pre-holiday cheer. PLEASE NOTE: ALL THOSE WHO WISH TO ATTEND THE LUNCH SHOULD REGISTER NO LATER THANTHE MORNING OF DECEMBER 6 SO THAT OUR BOOKING CAN BE CONFIRMED. 210 924 3256 to BOOK as places are limited.